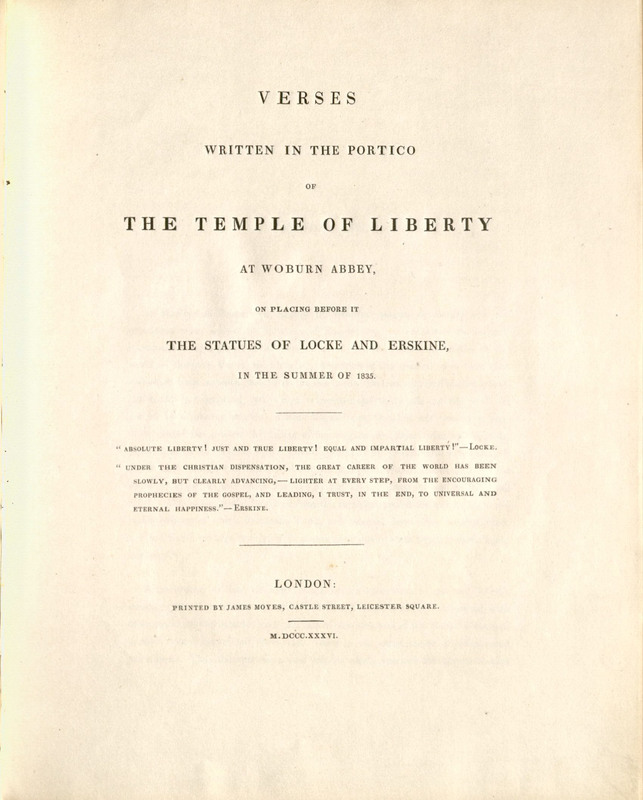 A second recent acquisition which reflects the theme of the Enduring Classical Tradition is Jeremiah Holmes Wiffen’s Verses Written in the Portico of the Temple of Liberty at Woburn Abbey, on the Placing before it the Statues of Locke and Erskine, in the summer of 1835. London: James Moyes, 1836. According to the colophon in the book fifty copies of Wiffen’s Verses were printed for private circulation and OCLC records three copies. Wiffen (1792-1836) was secretary and librarian to the sixth Duke of Bedford who lived at Woburn Abbey in Bedfordshire, England. 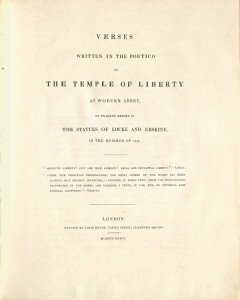 The Temple of Liberty was created by the fifth Duke and celebrated the English Whig causes of the abolition of slavery, Catholic emancipation and Parliamentary reform. A classical temple based on Greek model and filled with busts based on Roman models, the Temple of Liberty extolled the virtues of the politician, Charles James Fox (1749-1806), whose bust was at the center of the Temple and dramatically top-lit; busts of Fox’s closest friends and allies were arranged around the walls. Nicholas Penny, now Director of the National Gallery in London, has described the Temple as a “a sort of ideal Whig cabinet – a temple of modern worthies and a temple of friendship” in his classic article “The Whig Cult of Fox in Early Nineteenth-Century Sculpture” which appeared in Past and Present 70 (1976). Wiffen’s Verses celebrate the placing by the sixth Duke of Bedford of plaster casts of Sir Richard Wesmacott’s statues of the Whig hero, John Locke (1632-1704) and the great Whig lawyer and friend of Fox, Henry Erskine (1746-1817) in front of the Temple. The larger context of the Woburn Temple is discussed by Philip Ayres in his Classical Culture and the Idea of Rome in Eighteenth-Century England Cambridge: Cambridge University Press, 1997, especially pp. 82-83. “The Temple of Liberty at Woburn Abbey” by John Kenworthy-Browne, Apollo 130 (1989), 27-32 is an illustrated and detailed analysis of the entire project. Wiffen’s Verses were acquired from Joseph Felcone Rare Books of Princeton, NJ, with funds from the annual gift of David A. Goldberg, Class of 1954. Since 1981 Mr. Goldberg has given money each year to allow Houghton Library to bridge gaps in Houghton Library’s traditional areas of collecting. Not surprisingly one of the themes that arises out the books and manuscripts acquired with his gifts has been the enduring classical tradition.